Zaim Muzhaffar bin Ramlan, 24 and his wife Syakiratul Azimah binti Azmi, 24, graduated with a Bachelor of Information and Communication Technology as Best Student (Overall) and Best Student (Academic) respectively at the recent University Islam Antarabangsa Malaysia graduation ceremony. They got married in April this year, and they’re both currently excelling in their careers as programmers. 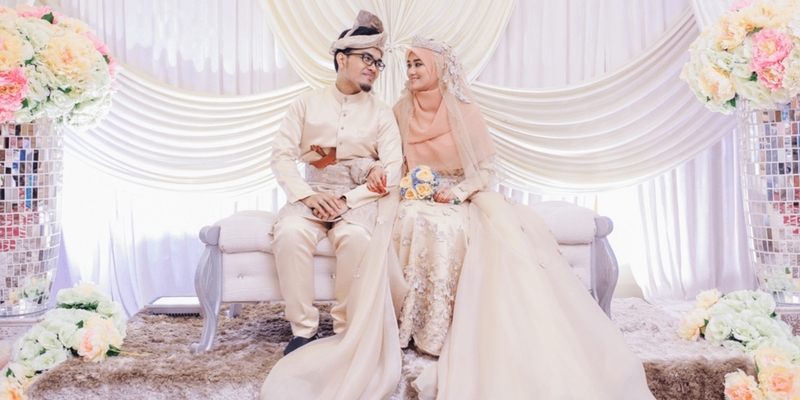 Inspired by their love story and contemporaneous success as both student and a couple unit, we reached out to Zaim to learn how they did it. 1. How did the both of you first meet? We met way back in 2012. It was our first year in our Foundation Studies. We started getting to know each other after a Hari Raya event in our university when she was the committee member for the event. A few months down the road, we became close friends. Having someone dear to you, who shares your passion, personality and favourite food, really gets you going. I knew she wasn’t just any girl, she was the girl. I reassured myself by getting to know her more through her friends because I knew that only the people who have traveled with you, knows you in and out. It turns out that my quest was worth it and I’m more assured than ever. That led me to meet her parents shortly after and here we are, happily married. Before I had met Syakira (my now wife), I was looking for someone who’s intelligent, simple and pleasing to the eyes. Simple in terms of personality, thinking, self-confidence and is aligned with my principles; nothing too complicated. But hey, nothing in this world is simple, right? That also applies for girls, too! Us guys have to know how to manage ourselves to become the best for our future partners. Needless to say, Syakiratul exceeded all my expectations and I’m very grateful for every second of it. 2. How did you know that she was ‘the one’? 2 things made me realise that she was the one. When you want to marry someone, make as much as effort as you can to realise that dream. 3 months after meeting her, I was determined and gathered my courage to meet her parents. Despite it being really nerve-wrecking, I portrayed my best self to her and her parents. Show that you’re serious in marrying her to her parents. Earn some extra income, save up for marriage and do your best in your studies as well as your co-curriculum. Also, since you’ve put in your utmost effort, you have got to be faithful and have faith that she will be the right one for you and trust your instincts. Never second-guess your decisions once you’ve made one. There will be bumps and bruises along the way that will challenge your instincts but it is your job to still believe in it. You are serious about her right? 3. What was it like dating your classmate? Having my life partner as a classmate was great and fun! As long as you read and think creatively, you can talk wonders and endlessly about your shared passion, challenges, assignments, projects and you would also have the option to be partners in course works. What makes it great is that you can complement each other out in areas that either of you lacks and you will care more about each other’s achievements. Like every other relationship, the sky is not always blue. There are ups and downs but instead of solely focusing on the issue, we try to focus on how to improve ourselves for each other and move on from that. What we believed in is that, in a minute of sadness, you lose 60 seconds of happiness. We won’t be young forever so we should enjoy the time we have with each other as much as we can and acknowledge our differences. 4. What is your secret to a successful university career and relationship? For me personally, it is about knowing what you want, knowing how things work and being different. You know what it takes to get those good grades so all that’s left is for you to work hard and maintain your grades. You also know that it takes more than just good grades to be acknowledged so you should do more: be involved in the community, contribute your knowledge and wisdom to help others. Finally, you know what you want: a happy and an ever-lasting relationship so you have to put aside your differences, as well as understand and appreciate each other. But hey, I’m no relationship expert. Just sharing some thoughts that I deem helpful. 5. What has been highlight of your relationship thus far? Without a doubt, it is the 3rd phase of our lives; University life. We learnt more about each other and our relationship in general. Along the way, we shared our passions, complemented each other’s abilities, excelled in a few projects and cours -works together, succeeded in participating in a national level programming competition, got married to each other and during our graduation, we both managed to surprise both of our parents on our achievements on the convocation day itself whilst going onto the stage together to take the scroll and the award! It is definitely a dream come true. 6. What did your parents think about the both of you getting together? We were lucky and thankful that both of our parents were really open. They were very supportive and they encouraged us to focus on our ambitions. I think that gave us the assurance we needed to pursue each other. 7. What is the best advice you could give to students who are also in a relationship right now? Our current achievements are just the beginning. We have a long way ahead and we both seek to learn and explore more as well as hopefully creating a name for ourselves along the way. We do dream of having our own businesses together and hope to have a ‘foundation’ of our own where we can contribute back to the community and make even the smallest dent in society.